Here we are, the final hours of 2018. I'm ending the year right by using up my last vacation day and spending the day playing with Lilly and prepping some snack items for tonight and brunch tomorrow. No, we don't have any party plans for this evening. See, having a little one sure does change things. Last year, Lilly was just shy of 3 months old which meant she was still in the middle of those exhausting newborn phases of not sleeping through the night and being awake at all hours of the night. So we were well awake at midnight, hoping that she was close to being ready for sleep (by sleep I mean the normal stretch of 3 hours before she was awake again and ready to eat). This year, even though she's just shy of 15 months, she's sleeping through the night but mommy and daddy are still so damn exhausted. It makes me feel even more exhausted just thinking about staying up past midnight partying. And then, there's the thought of the potential hangover the next day. But ya know what? We're totally fine to stay in, eat and have a few drinks, play a game or two and probably fall asleep before the ball drops and rings in the new year. My younger self would have been appalled by these "plans". I'm sure in a few short years Lilly will feel the excitement of New Year's Eve and want to try and stay awake for a celebration. I'm actually looking forward to that. Little kids have a way of reigniting the excitement and fun of the simple things. In my prep for our brunch tomorrow morning, I've had this idea to make a blueberry compound butter. Compound butters are really easy to make but add something really special to your meal. The only trick is rolling up the parchment paper to make sure the butter is really snug and tight. It's ok it it isn't perfect, after all we're talking about butter that eventually get spread and melted and will lose a perfect shape anyway. I really love how this blueberry compound butter came out. I wanted to make it a bit on the savory side, instead of a cavity-zinging sweet butter. By all means, if you're looking for crazy sweet just up the sugar, but I think you'll like this. You get the taste of fresh blueberry, warm cinnamon and nutmeg, and a bit of sugar to sweeten. Spread onto warmed biscuits and enjoy at your next brunch! 1. Place blueberries in a food processor and blend until smooth. It's ok to have small pieces of blueberries, it doesn't have to be completely smooth. 2. In a stand mixer or with a handheld mixer, combine the blueberries and butter, whip until incorporated. Stir in the sugar, cinnamon, and nutmeg. 3. Unroll a large piece of parchment paper and fold in half. Spoon the blueberry butter onto the paper and form into a log shape about 1 inch in height. Fold the parchment paper around the butter and continue to roll, squeezing firmly to make sure the butter is condensed together. Twist the edges of the parchment paper. Place in freezer for 30 minutes, then move to the fridge for another 30 minutes. Slice into discs and spread onto warm biscuits. The winter cold has officially taken over our household. Last weekend we took Miss Lilly to an indoor play place that we'd been to several times, one of those giant rooms that's section off into different themed play areas. Two days later the poor thing got her very first cold. I do realize how incredibly lucky we are that she made it 14 months before getting sick. She was hit hard with the head cold and she and I spent two very rough nights on the couch. I guess it's no surprise that just as she's turned the corner and starting to get better, Daddy and Mommy are getting hit with the bug. It's an orchestra of sniffles, coughs, sneezes, nose blows, repeat. Hopefully we're all back to 100% before Christmas. A little head cold can't keep me out of the kitchen though. But isn't that the life of a mom? I really wanted to whip up these cookies because they are so easy and make the perfect little treat. The only dangerous part is they are so small you wind up eating so many of them because they are so good! My mom used to make these when we were kids, and last year I finally asked her for the recipe. I love that you actually bake this as one large cookie, then with your pizza cutter you slice them into little squares. I like going pretty small with them, the size of about two bites. They are so adorable! These would make a great gift for a neighbor or something to bring into the office for your coworkers. Or, you can always make these for no reason at all other than to snack on them with a cup of coffee. Which I may or may not be doing right now. -This dough is wet and a little sticky, it's not your traditional drier dough. -Use the smallest baking sheet you have, when you spread out the dough it's not going to spread all the way to the edges. Mine looks like this. I measured 9" tall by 10". 1. Heat oven to 375. In a large bowl cream together the shortening and the 3/4 cup sugar. Add in the oil, egg, milk, and almond extra and beat until light and fluffy. 2. Gradually blend in the flour, baking powder, and salt at low speed. Spread onto an ungreased baking pan. Mixture will not cover the entire pan, spread until about 1/4" thick. Mine measured 9x10. Sprinkle with the 1 tablespoon sugar and sprinkles. Bake for 10-12 minutes. Let cool for 5 minutes then slice with a pizza cutter to the desired cookie size. Are you finished with your Holiday shopping? This is the first year that I completed all of my shopping without setting foot inside a single brick and mortar store. That's right. All shopping was done in the comfort of my pajamas sitting on my couch with a glass of wine in hand. Admittedly, sometimes that glass(es) of wine makes me awfully generous. But I feel quite accomplished, but also feeling quite old with how annoyed and frustrated I've become with the crowds that is holiday shopping. I remember in my high school days it was almost a yearly tradition for my brother and I to go Christmas shopping on Christmas Eve. After dinner we'd hit the mall and divide and conquer. Looking back I can't believe my mom let us do that. People are crazy this time of year. They drive crazy. They act crazy around sales. They act crazy waiting in long lines. But, there was something fun about being in the mix of the hectic last minute shopping frenzy. I'm sure one day Lilly will want to go shopping with her friends and I'll have to put all of my fears aside and let her grow. 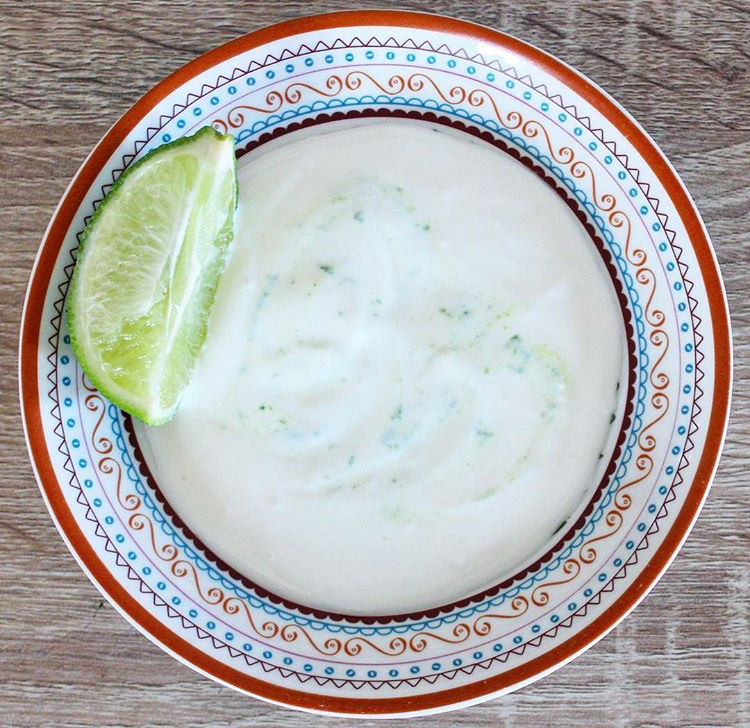 So this Lime Sour Cream is my new obsession. I swear I would put this on everything if I could. 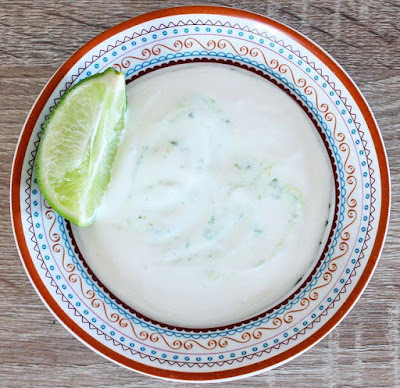 What makes this so great is that the lime juice cuts through the heavy tartness of the sour cream making this really light and refreshing, this won't make you feel weighed down. Put this on tacos, quesadillas, I've even used this as a dipping side to my sweet potato home fries. 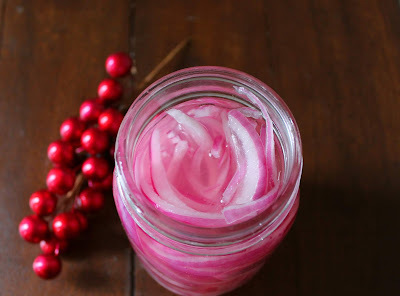 This is going to become your new go-to condiment. 1. Combine the sour cream and lime juice, adding more or less juice depending on taste. I prefer a strong lime flavor so I'll use the 3 tablespoons. Add a dash of salt and pepper. I began this blog all the way back in 2011. I'll do the math for you...my first post was nearly 7 and 1/2 years ago. If you've never seen it, go take a look here and try not to laugh. Food styling was clearly not even on my radar. It's been quite a journey...both personally and culinarily (ok that's that a word but go with it). I love how cooking and baking can evolve. Attempting more ambitious recipes, experimenting with my own creations, and trying new flavors and ingredients. When I met my now husband who is Dominican, I started cooking with so many new seasonings and was introduced to a new world of recipes. We still talk about one of the first nights I was cooking dinner for him. To his shock and horror, I was making boil in a bag rice. Try making a Dominican bag rice and let me know how that goes over. One morning for breakfast my husband, well not my husband at the time, decided to 'wow' me with a traditional Dominican breakfast: mangu. Mangu is mashed plantains and is incredibly simple but extremely filling and typically topped with pickled red onions (get the recipe here) served with a side of fried salami, fried queso freir, and eggs. I promise you, you eat mangu for breakfast and you won't be hungry until dinner. 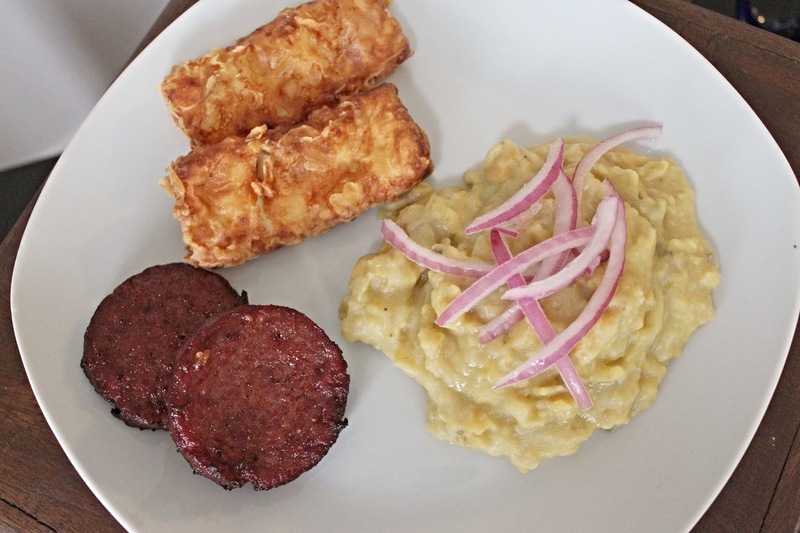 A few notes if you're new to making mangu. 1. You want to buy the green plantains, not the yellow. 2. Make sure you boil them long enough to make the mashing easier. 3. When you add the water to mash it's going to look like you've added too much, but plantains get hard and thicken as they cool. Trust me, this gets me every time still. I swear I've added too much water and ruined it, but as you mash and let it sit the mangu will thicken and finish at the right consistency. 1. Peel the plantains and cut into pieces about 1/2 inch thick. Boil for about 20 minutes, until a fork easily pierces the pieces. 2. As the plantains finish cooking, reserve 1 cup of the water from the pot, then drain the rest and pour the plantain pieces into a large bowl over the butter. Begin mashing, adding the 1 cup water. 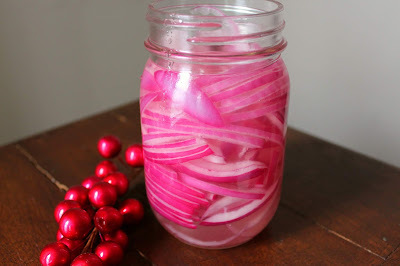 You can add it a little at a time, but remember mangu thickens as it sits so you should use the whole cup of water. Mash to the consistency you desire, some people hate any chunks while my husband and I like ours a bit lumpy. Let sit for a few minutes before serving to allow it to "set". Top with pickled red onions.